Does your furniture slope on an uneven, carpeted floor? Looking for a solution? Hard plastic shims are the leveling wedge you need! Hard plastic shims give your furniture something solid to stand on and prevent wobbling or uneven tilts. Having soft cushiony carpet can really make a home feel cozy. But it can also make your furniture less stable and more prone to tipping over. Wobble Wedges make the perfect furniture levelers on all soft flooring because the hard plastic shims create a stable base. 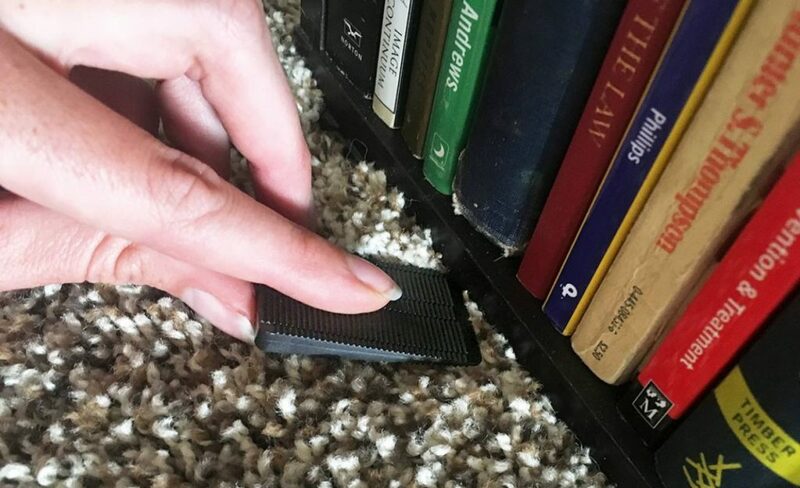 Level your bookcases, lamps, statues, desks, etc., and don’t worry about the rug or soft carpet, you will be able to keep it from rocking with our leveling wedges. Therapeutic foam pads can make standing for long periods more comfortable, they can really help you with aches and pains. That extra cushion makes a difference, but it doesn’t mean you can’t have safe, level furniture even if it sits on a padded floor! Hard plastic shims give stability and are ideal for leveling on soft padded flooring. If your standing desk rests unevenly on your cushioned pad, use hard plastic Wobble Wedges to prop it firmly in place. Or use them to level your workbench or bookshelf in your workshop if they rest on a foam pad. 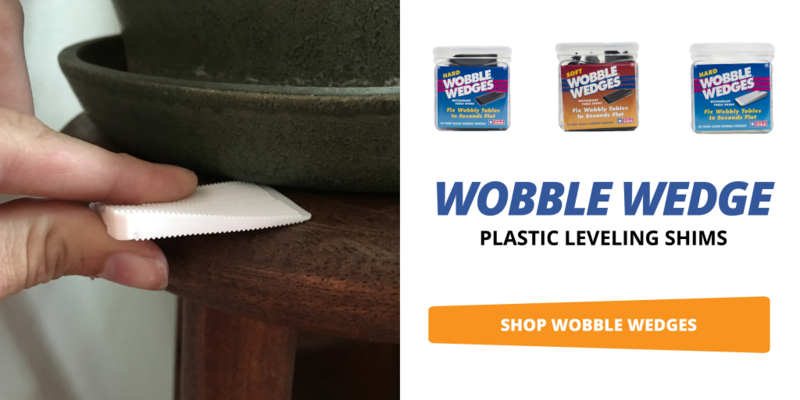 Wobble Wedge hard plastic shims can take over 2,000lbs of weight and because of the patented interlocking ridges you can fill any space you need and the wedges won’t slip! Another place that soft flooring can make furniture less stable is the bathroom. Soft, plush rugs make your bathroom feel great, but if the shelving unit is resting on the rug, one little bump might knock your toiletries everywhere. Wobble Wedge hard plastic shims can be used to add stability to bathroom shelving units that rest on rugs. Our hard plastic shims come in clear and black, so you can level all of your furniture without anyone being the wiser. They’ll blend right in!